Set to take the lights show in one box to a new level is the Equinox Domin8R II. 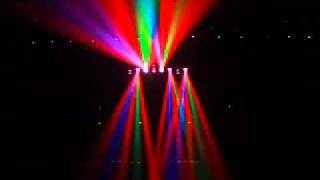 Featuring 8 mirrors and 120 Ultra Bright 5mm LEDs (R: 40, G: 40, B: 40), this innovative effect will shoot penetrating, coloured, beams of light over long distances and is great for producing aerial effects over crowds. Considering purchasing the Equinox Dominator II - Domin8R - DMX LED Effect? Have questions? Ask people who've recently bought one. Can this unit be mounted upside down? eg on top of a bar instead of being hung. I doubt it, it’s pretty heavy. doubt to handle would hold it upside down. Do you own the Equinox Dominator II - Domin8R - DMX LED Effect? Why not write a review based on your experience with it. This product is good for the price. Lights up the room well and comes with DMX capabilities. My slight concern with this product is the high pitched sound it makes when is switched on and the lights are moving. Ideal for home parties and small clubs. Would definitely buy another one if I ever needed it. 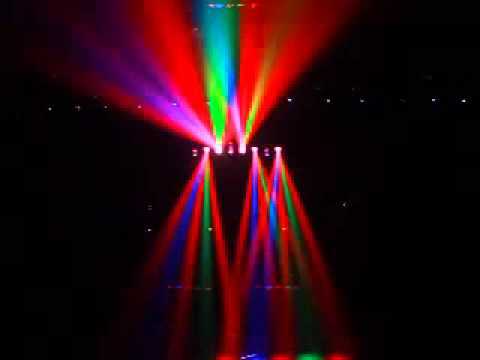 Great product and light show, highly recommend this product.. A bit noisy, just turn the music up. This is a brilliant piece of kit. Easy to set up and works a treat. The product has auto modes that can be used via dmx programming which is also good if you have limited knowledge. I've used it twice now and looks good...I think it will work better using smoke, but unfortunately the two venues I've been at doesn't allow smoke! I use a data moon with it and they compliment each other well! Great quality item. Very pleased with the performance and fast delivery. This light is fantastic! plug in and its ready to go. simple display to set to your required setting. the 'sound to light' works really well with almost every genre of music that I've played and the light (with a little smoke) looks great in medium to large venues! Cant wait to hook this up to a DMX controller! So happy with this bit of kit! cant wait to show it off! WOW what a great bit of kt, perfect for clubs who want a lot of effects for a low price, the power of 8 scanners in one great unit! must have! Seen a video for Equinox Dominator II - Domin8R - DMX LED Effect online or have you own video? Check out Equinox Dominator II - Domin8R - DMX LED Effect on DJkit.com!